Posh winger Siriki Dembele takes on Portsmouth's Nathan Thormpson. Photo: Joe Dent/theposh.com. 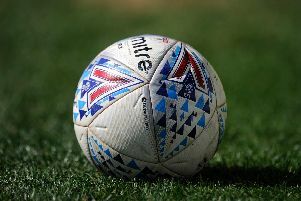 This was a tough day for Peterborough United players as they lost their unbeaten League One record as well as top spot in the table (September 15). Portsmouth are now top after winning 2-1 at the ABAX in a scrappy. physical, foul-laden game in which individuals struggled to shine. Posh winger Joe Ward escapes from Portsmouth's Gareth Evans. Photo: Joe Dent/theposh.com. Posh skipper Alex Woodyard again displayed his appetite for a battle, while Siriki Dembele was responsible for most flashes of quality and inform Ryan Tafazolli defended well. RATINGS: 10- Perfect, 9 - Outstanding, 8 - Very good, 7 - Good, 6 - Average, 5 - Poor, 4 - Stinker. Posh striker Matt Godden scores late on for Portsmouth. Photo: Joe Dent/theposh.com. Marcus Maddison: (for Ward, 72 mins) Should probably be starting now. Created one great chance and a big hand in the Posh goal.